If you have a hummingbird feeder, chances are it has some kind of red on it and that’s not by coincidence. The color red, along with other bright colors, is a favorite among hummingbirds because it helps them find the tastiest nectar. If you’re wanting to attract hummingbirds to your garden, these plants will do the job with their bright blooms. Montbretia (Crocosmia)- The vibrantly colored flowers bloom in summer to fall and will attract both hummingbirds and butterflies to your garden. The sword-like, rich green foliage compliments the red, orange, and yellow funnel shaped flowers to make them really stand out. 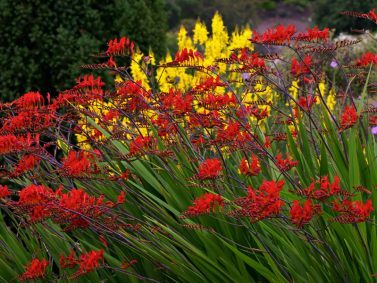 Crocosmia likes to be watered regularly in well-drained soils but once established, they can tolerate drier soils. Place in partial to full sun and remove stalks of flowers once they have faded. 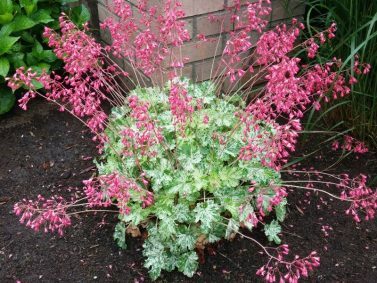 Coral Bells (Heuchera)- While usually selected for its outstanding foliage colors, Coral Bells’ flowers also attract hummingbirds in early summer. Tiny flowers rise up from the foliage mound in sprays and are usually white/pink/purple. The evergreen foliage comes in all shades of colors and multicolored varieties as well. Heucheras do best in filtered to full sun and should be watered regularly but do try to avoid extra winter moisture. Mallow (Hibiscus)- Large blooms give any garden a tropical feel and act as a giant welcome sign to hummingbirds. These blooms can get to be 9-10” across and come in vibrant reds, yellows, oranges, purples, pinks, and white. Each bloom only lasts one day, but one or more flowers will most likely open each day keeping a nice succession of blooms going. Just one plant can have up to 250 blooms each season! This is a nice choice for a later blooming plant to keep the hummingbirds coming back and is also a great multi-season plant. Cultivars like ‘Midnight Marvel’ have excellent fall coloring. 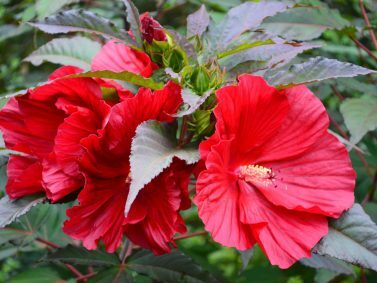 Hibiscus does best in full sun but can handle partial shade and likes moist soil with protection from strong winds. 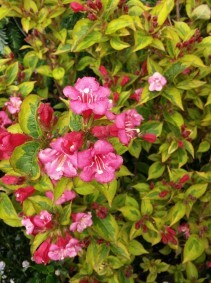 Weigela- The trumpet shaped flowers of Weigelas are loved by hummingbirds. The flowers come in shades of pinks, reds, and purples. Not only are the flowers attractive, but you can find cultivars with interesting foliage as well. Some like ‘Wine and Roses’, ‘Midnight Wine’, and ‘Spilled Wine’ has dark burgundy red/purple foliage and others have golden green foliage like ‘Golden Jackpot’ and ‘Carlton’. You can also find variegated cultivars of Weigelas like ‘My Monet’, ‘French Lace’, and ‘Morcolzam’. Weigelas do best in partial to full sun and well-drained soils with regular watering. Coneflower (Echinacea)- For an easy to grow, hummingbird attracting plant, Echinacea’s can’t be beat. They come in a ton of different colors and can handle moderate drought once established. They start blooming in late spring and continue well through summer providing plenty of food throughout the season. 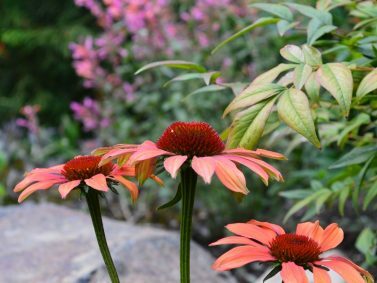 Coneflowers are good for cut flowers as well and will do best in well-drain soils and full sun. 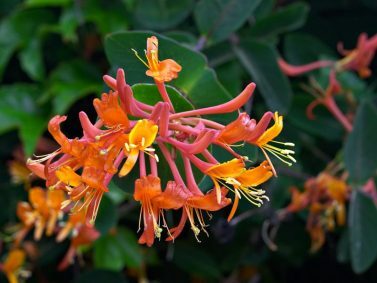 Honeysuckle (Lonicera)- Honeysuckles are great vine options that can be used to cover an arbor, trellis, fence, or retaining walls. Some, like the Goldflame Honeysuckle, can also be pruned to form a shrub-like shape. The fragrant, tubular shade flowers bloom throughout summer and can be red, orange, purple, pink, and other warmer colors. They are easy to grow in well-drained soils with regular watering. Honeysuckles will get the best flowering in full sun, but they can handle partial sun. Salvia- The tall stalks of flower clusters come back fuller each year and works great to attract more hummingbirds year after year. Flowers blooms in early to mid-summer and come in shades of blue, purple, pink, white, and red. You can remove spent flowers throughout the season to encourage new blooms. They’ll do best in full sun with well-drained soils with regular watering. 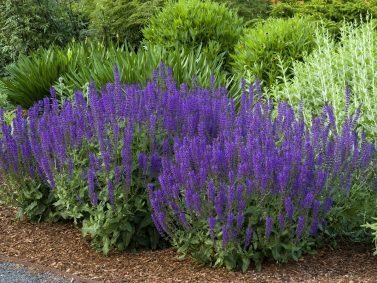 Once established Salvia’s can tolerate short periods of drought. Bleeding Hearts (Dicentra)- The heart shaped flowers come in reds, pinks, purples, and white which all attract hummingbirds. This plant isn’t just about its blooms though. Depending on the cultivar, the deciduous foliage can be rich green to golden to blue-green. Some even have dainty foliage that resembles ferns providing an interesting texture in the garden. 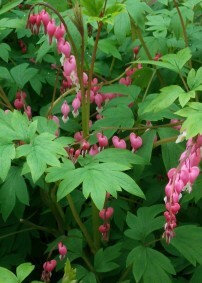 Bleeding Hearts prefer full shade to partial sun and like to be watered regularly, especially in times of extreme heat. Try to avoid placing in constantly wet or soggy soils. 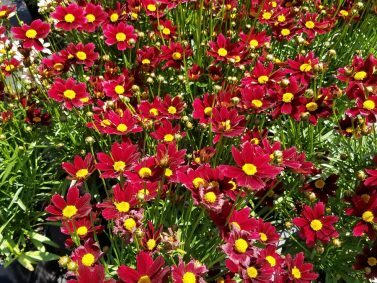 Lil Bang Red Elf Tickseed (Coreopsis x ‘Red Elf’)- The bright red blooms of Lil Bang Red Elf Tickseed have yellow centers that will catch any hummingbird’s eye. In the heat of summer, the tips of the flowers will become white and will continue to bloom summer through fall. It will do best in full sun and well-drained soil. 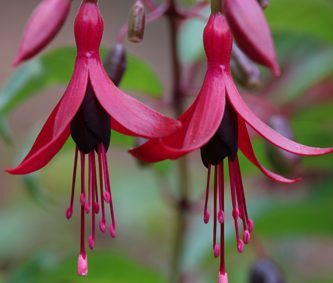 Hardy Fuchsia (Fuchsia magellanica)- This deciduous, upright shrub is one of the more cold tolerant of the fuchsias. It has tubular shaped flowers in shades of pink and purple. They do best in well-drained, moist soil and full morning sun and partial afternoon shade. Depending on how cold the winter is, it may die back to the ground in winter but will come back up in spring. 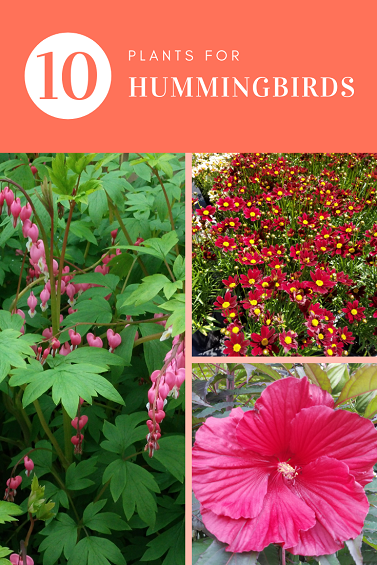 If you’re wanting to attract more hummingbirds, these plants are a good place to start and don’t require nearly as much work as changing the hummingbird feeders every day! It’s also a good idea to keep a small bird bath nearby so that they have a place to stop, rest, and drink water. Do you have any plants in your garden that hummingbirds love to hang around? Let us know in the comments, we’d love to hear from you! 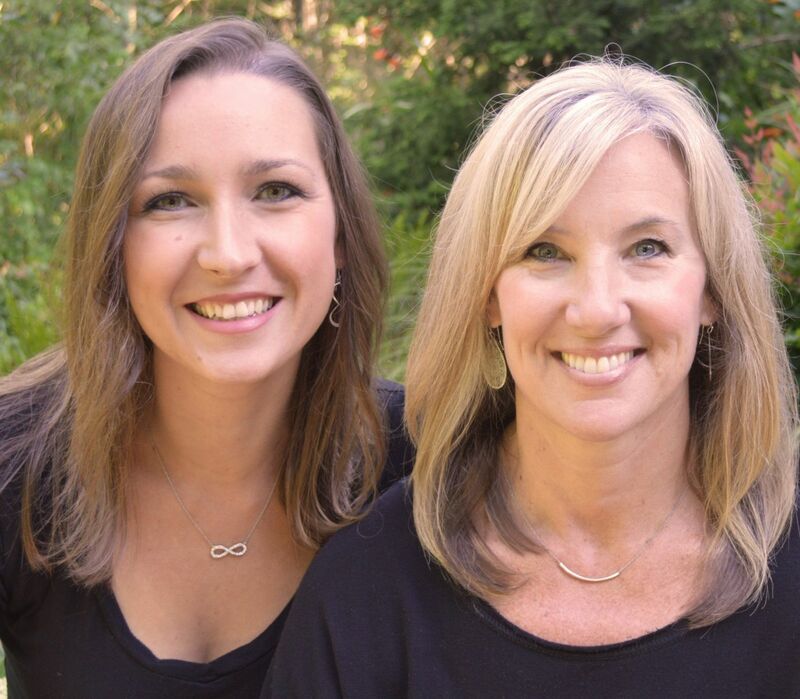 Organized under Buds and Blooms, Garden Tips & Advice, Gardens, Plants I Dig, Wildlife. Labeled as bleeding hearts, Coneflower, coral bells, coreopsis, crocosmia, dicentra, echinacea, fuchsia, Fuchsia magellanica, hardy fuchsia, Heuchera, hibiscus, honeysuckle, how to attract hummingbirds, hummingbird attracting plants, hummingbird food, hummingbird garden, lonicera, mallow, montbretia, plants for butterflies, plants for hummingbirds, salvia, tickseed, Weigela.